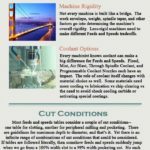 Here’s your comprehensive guide to Feeds and Speeds for Wood, together with Tips and Techniques that are specific to cutting wood on a CNC Machine. Just 4 wood types? Why not more? 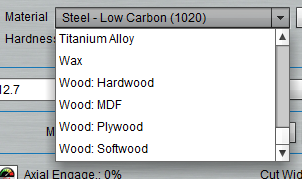 To access the full variety of woods under each family, use the “More…” button on G-Wizard. People wonder why we don’t have a lot more categories. The short answer answer is that there are hundreds of sub-categories corresponding to individual wood species accessible via the “More” button. Use them if you need to fine tune for maximum performance. But, for basic roughing work, also be aware that you can do a lot with just the main sub-categories. This is due to the size of the “sweet spot” that relates feeds and speeds to good results in a material, together with the relative hardness of the woods (or other materials) versus the cutters (HSS or Carbide). The green areas reflect ideal Sweet Spot matches for a material and cutting conditions. You can optimize MRR (Material Removal Rate), Surface Finish, and to an extent a blend of all three. Red reflects danger zones. It’s important to note you can get into just as much trouble running too slowly (due to rubbing) as running too quickly. – They get too hot, which softens the tool and results in a dull edge. Tools have a certain maximum speed, called the “Surface Speed” that governs how fast they can run against a given material. Running too slowly relative to feeds also generates a lot of heat due to Rubbing. This destroys a tool gradually, though gradual can mean a matter of minutes if the tool is hot enough. – Tools can break because the flutes get too full, the chips have no place to go, and the tool jams and snaps off. This destroys a tool suddenly and is more commonly what beginners see. A lot else can shorten a tools life–chipped edges in some materials, materials like stainless steel can “work harden” and suddenly become much harder during the cutting process, and some materials like aluminum try to weld themselves to the cutting edge if lubricant or appropriate tool coatings are not used. But, over heating and chip loading are the two main tool life enemies that are directly feeds and speeds related. You can learn all this and much more from our free Feeds and Speeds Tutorial, but for now, let’s stay with this idea of a Sweet Spot. In general, the sweet spots for woods are much larger than for metals. For harder steels and difficult materials like Titanium, the sweet spot gets very small indeed. Imagine there are actual numbers on our Sweet Spot diagram. “Size” of Sweet Spot refers to how wide a range of numbers are safe. What determines the “Size” of a Sweet Spot? A lot of this is all up to that relative difference in hardness between material and cutter. Even Carbide is not all that much harder than hardened steel whereas it is phenomenally harder than even the hardest woods. Red Oak, for example, has a Brinell Hardness of about 3.7. Mild steel is 120, hardened steel is 900, and tungsten carbide is 4000! It turns out that the characteristics that affect the feeds and speeds for wood are different than hardness. They have to do for example with the behavior of the sap relative to the sawdust and how the chips are made. Plastics, similarly, can behave differently–hard plastics as a name is a bit of a misnomer (though it is the industry standard in tooling catalogs). It refers to the chipping characteristics of the plastic. Hard Plastic turns to dust–it shatters. Soft Plastics allow a nice clean chip to be sliced off, almost like you slice cheese with a knife. Of course, the same is true for woods. “Hard” Wood versus “Soft” Wood has more to do with the seeds of the Wood than the actual hardness. Balsa seems soft but is technically a Hardwood. Hardwood seeds have a covering–shell or fruit, while Softwood does not. Another factor influencing all this has to do with manufacturing process for the material. In the case of materials like MDF and Plywood, their manufacture can result in abrasive grit being embedded in the layers and that grit matters more than the wood in feeds and speeds. This is why so much router work prefers Carbide tooling even though wood is relatively soft. HSS just doesn’t stand up to that kind of grit very well. 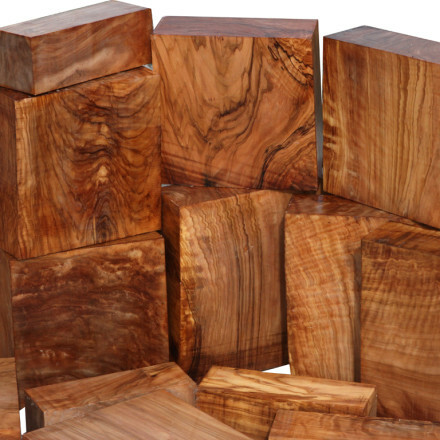 With all that said, there are still differencs in hardness for various woods, and there is a standard scale, called the “Janka” scale that is used to rate the relative hardness of various woods. In most cases, you’ll want to purchase carbide cutters. First, a lot of wood products such as plywood and MDF can contain considerable amounts of highly abrasive grit due to the way they are manufactured. That grit radically shortens the life of HSS tools and you’ll need carbide to stand up to it. Second, the spindle speeds used in most CNC woodwork are very fast, and this is also advantageous for Carbide because it tolerates the higher temperatures associated with the fast speeds better. Lastly, carbide is much stiffer than HSS, and so tool deflection is less likely to be a problem. Here is a great article: What Every CNCer Ought to Know About Tool Deflection. – Upcut: This is the normal end mill style. The spiral flute carries chips up and out of the hole as it cuts. These are probably the worst about splintering, though with serious fine tuning and slower feeds and speeds you may be able to tame it a bit. 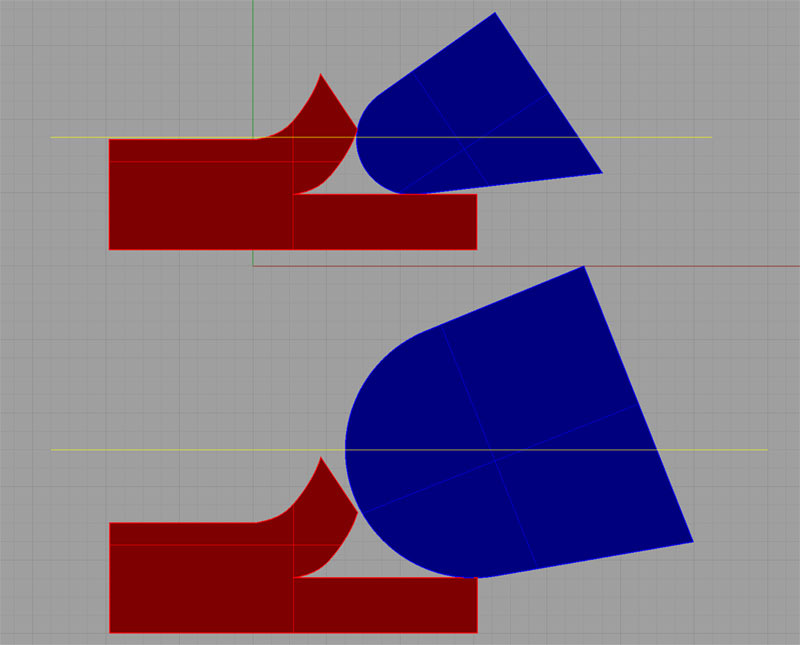 – Downcut: With downcut geometry, the spiral is reversed so it pushes down instead of pulling up. This is great for reducing splintering of the top surface, but you do want to be careful the chips can go somewhere. Cutting deep tight slots can be problematic for this type of cutter sometimes. – Compression: A compression cut is a combination of upcut and downcut. It has the spiral set to pull up at the bottom of the material, then it reverses direction at the top. It’s name comes because it is pushing the chips to the center of the cutter, or “comrpessing” them, in other words. Compression cutters can avoid splintering both top and bottom, so are ideal for many applications where you’re making one pass to cut all the way through the material. – Straight Flute: Straight flutes have no twist. This reduces their likelihood of splintering, and it also makes the cutters cheaper. However, their performance is not so hot in terms of ultimate feeds and speeds. For much more on Cutters for CNC Routers, see our specific article. The more porous the wood, the more likely it is to splinter. Slower, shallower cuts will reduce the splintering. 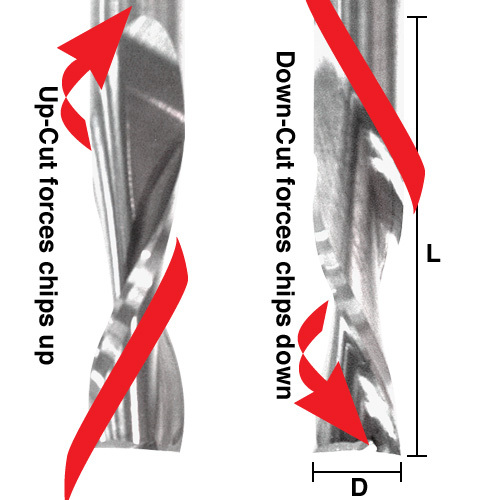 Climb Cutting can make tear-out less like than Conventional Milling. Spray a sealer like laquer on the wood to give it a little more support. 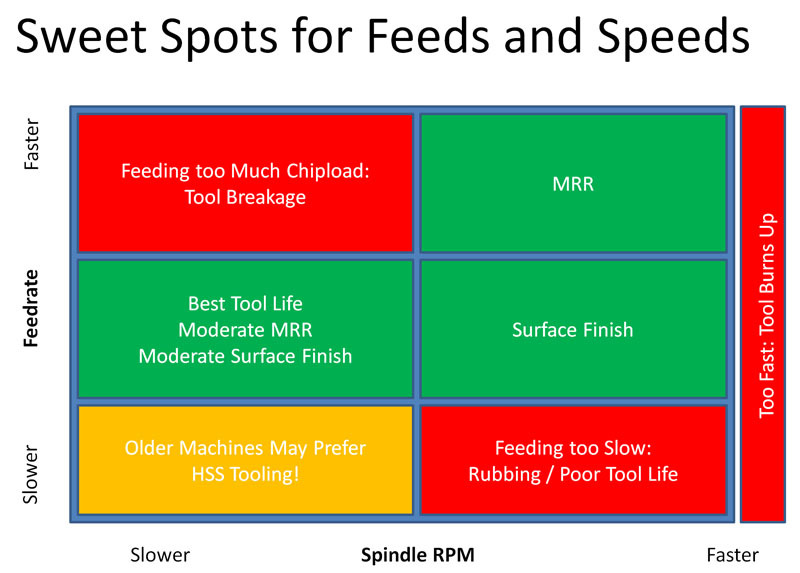 Make sure you’re running proper feeds and speeds so that your cutters won’t rub. Rubbing generates a lot of heat. 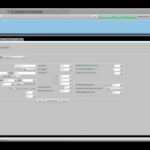 You need a Feeds and Speeds Calculator to do the job right. Preferably one like our G-Wizard that has a Rubbing Warning. Keep cutters clean. Any dust or resin buildup adds friction which can lead to overheating the material. Use sharp cutters. If you can run your fingernail over the edge without shaving off a bit of fingernail, your cutter is probably dull. Take shallower passes. Hogging with deep passes removes material fast, but it can also cause tear-out and overheating that leads to burning. – Cost: When high levels of precision are needed (guitar making is very precise), the VMC can achieve precision at a lower price point. – Floor Space: Most of the gantries are set up to take 4×8 sheets. These custom shops are doing smaller runs and they’re not machining plywood sheets. The desire to include climate control to keep the wood stable also means shop floor square footage is at a premium. Smaller machine footprints help keep this cost under control. 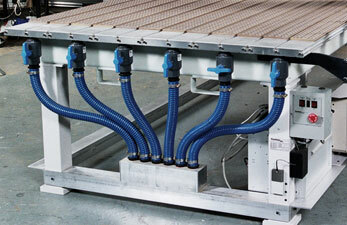 – Dust Control: The full enclosure of a VMC really helps keep the dust down in the shop. – Tool Changer: While they’re certainly available for CNC Routers, they’re standard on VMC’s. Fender needs 21 tools for their application and keeps 20 in the changer and the 21st sits in a dedicated space on the table where the spindle can fetch it as needed. Vacuum Tables are often the preferred method of workholding for wood, and we have a huge page chock full of great information on how to use Vacuum Tables. 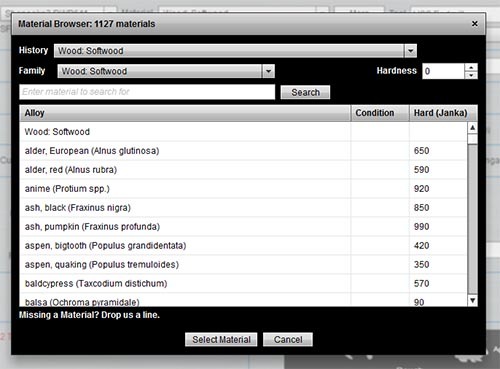 – A detailed wood database to fine tune Feeds and Speeds by wood species. – Support for the special cutters used by CNC Routers such as downcut, compression, and straight flute. 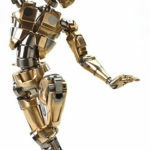 – If you have a hobby-class machine, it isn’t as sturdy or rigid as a commercial machine. Feeds and Speeds will need to be adjusted. – Support to help you limit feeds and speeds to levels that won’t pop the parts of your vacuum table. 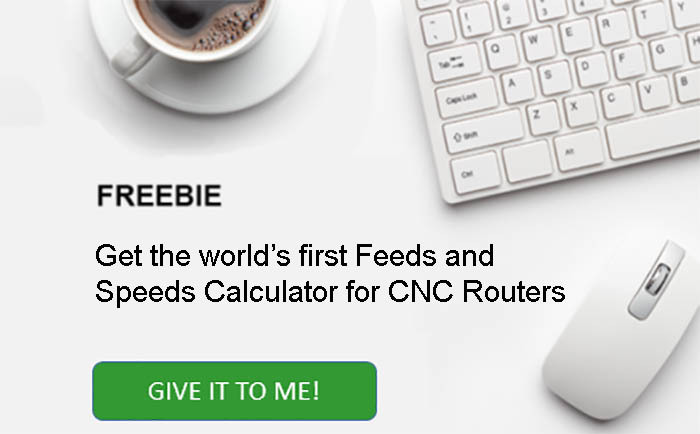 Our G-Wizard Calculator is the world’s first feeds and speeds calculator specifically designed for CNC Router use, and it does all that and more. If the cutter is getting hot to the touch (careful! ), and especially if there is any discoloration or the wood is being burnt, your feedrate relative to the proper feedrate is too slow, and the cutter is rubbing. For a full explanation of rubbing, see this article from our Feeds and Speeds Tutorials.